The Bare Access 4 features mesh lining and mesh upper that is breathable and non-irritating to the skin. The M Select FRESH is a treatment for the shoe that staves off odor-causing bacteria, essentially keeping the interior environment clean and healthy. Some runners took note of the cushioning tech that gives ground-to-foot feedback for a faster paced movement over the terrain. Runners welcomed the Bare Access Outsole, which features Vibram pods for extreme levels of traction and efficiency with every step. This running shoe feels light and fast for competition, according to some runners. Parts of the shoe started to wear off quickly, based on some comments. It didn’t have very efficient anti-debris components because small stones tended to invade the interior and disrupt the comfort of some runners. The Merrell Bare Access 4 is a minimalist running shoe with hyper-responsive insoles that give runners full control while running. It is a good option for those who are looking for an affordable lightweight road shoe. The Bare Access 4 has a few drawbacks, but it’s still able to provide a comfortable and satisfying ride. 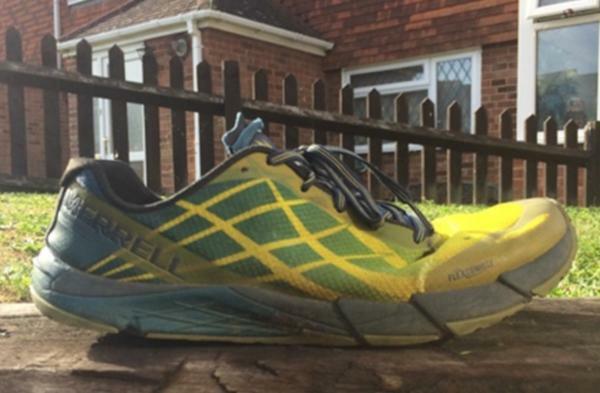 The Merrell Bare Access 4 is a great running shoe. I’ve owned the original, the second, third and fourth version. I’ll continue to buy this shoe until they stop making it. Here's why. But as a means to advise others on what makes it such a great shoe, I’ll also try to measure it on some alternative criteria. With a modern landscape for running shoes as diverse as we are currently enjoying, it takes a special shoe to stand out. The Bare Access 4 manages that with room to spare. A new niche seems to be carved out with every new year’s release of shoes. In days gone by, there may have been high mileage trainers, racing flats and trail shoes. Now we are inundated with a lightweight trial, minimal, maximal, low drop, lightweight… The list goes on. All this without delving into the dark corners of pronation and correction. If I were to name a niche “perfect travel shoe", the Merrell Bare Access series would have held the number one spot for the last six years since its global release. I have been an avid fan of this shoe since it’s inception. I’ve owned four pairs across three generations, and it’s now the first thing I pack when I load up my backpack for any travel. As a high mileage trainer, it’s unrivaled. The Vibram outsole is grippy, insanely hard wearing and refuses to submit to any cuts or tears. As a tempo or track session shoe, it does a job that it wasn’t built for. It’s lightweight and responsive sole marry up to deliver performance that’s close to many racing flats that I’ve owned. The shoe is perfect for hill sessions for the same reason that it delivers on the track. It’s light, flexible and due to the sculpted fit, refuses to shift around on your foot during those final hill reps when your form starts to falter, and things start to get a little sloppy. As much as anything else, and for what will be an irrelevance for some: It’s insanely hard wearing as a day to day shoe. The latest iteration of the model, the Bare Access 4 has seen me travel for 12 weeks from Auckland, through Bali, Croatia, Germany, France, and England. I’ve hiked mountains, waterfall tracks, ran so many temple summits, rocky island beach paths, forests, farmers fields, sprinted along La Seine & The Thames and the shoe has delivered. Then, post shower and some downtime, they’ve been on my feet for the rest of the day. I love this shoe. I try to travel as light as possible, much to my partners' annoyance and the ability to only pack one pair of shoes to cover a short or long break is a big deal to me. To use the same shoe for a walk around Croatian Ruins as well as a 2-hour long run is a huge positive. I’ve ran around 400 Miles (thanks Strava) in these shoes, walked another 600 Miles (thank you Fitbit) in them, and only now are they showing signs of needing to be put out for pasture. For that reason, I’ve just ordered another pair, now the 5th in total to continue the training program I started when I left New Zealand. Feel free to check back in around 3-6 months for another review, but I’m sure that the love affair will continue. All in all, I would actually really recommend these shoes. They're very nice; good quality. They're actually very light, also. To my greatest surprise, I also loved the fact that there isn’t too much cushioning, that I could feel the ground better than with my previous pair. These shoes feel just fine, but I regard them as a step back from the Bare Access 3s. Contrary to the cloth-like quality of the previous version’s upper material, the Merrell Bare Access 4 utilizes a more robust mesh that’s full-bodied and durable. The holes on its façade are ports of ventilation where air constantly enters to keep the foot cool and dry. The Bare Access 4 reduces the amount of stitching and stitched-on layers on top of its upper. A seamless construction has been implemented here to fully give a non-irritating wearing experience for the foot. Synthetic overlays that help in wrapping the sides and heel of the foot are fused directly onto the upper unit, so it doesn’t affect the overall weight of this running shoe. It’s truly created to deliver a super lightweight running experience to those who wear it. The mid-sole unit is thicker and more responsive this time around. The cushioning systems featured here support the foot well and handle the weight of the runner responsibly. Rebound qualities and flexibility are integrated in it, making it a shoe that is forgiving when it comes to the natural movement of the foot. The outsole delivers durable protection for the wearer. It features one of the most robust outsole technologies in the market. It doesn’t succumb to abrasion and it even allows the forefoot flex without feeling restrained because of the outsole material. It’s responsive and pliable. The 4th version of the Merrell Bare Access is slightly smaller than the regular standards of length. It is recommended that runners buy a ½ smaller size when it comes to this running shoe. It has a medium width when it comes to its heel, mid-foot and forefoot. Its low-cut design allows the runner to move naturally and more freely, while its curved shape lets the natural curvature of the foot to fit well in it. This running shoe features the Bare Access Outsole for its external layer. It has a rubber foundation for added durability, but its main technology is the Vibram, which is a set of pods that give durable protection from wear & tear, as well as traction over the surfaces. Flex grooves in the forefoot allow the runner to have a surer and more responsive toe-off. It’s a forgiving outsole unit that allows the foot to travel through the gait cycle with ease and comfort. The MBound is a mid-sole technology that’s meant to deliver surface feedback to the foot of the runner. While giving cushioning, it lets the runner have a feel of the surface, making the running experience seem closer to the ground. The CMEVA or the compression molded Ethylene vinyl acetate is a mid-sole foam that’s of high quality. It carries the foot well and doesn’t break down easily, even after many uses. Its durability lets the runner use this shoe often with trust that the mid-sole will remain robust. The upper unit makes use of a mix between Air Mesh and Synthetic Leather. It makes a more durable and full-bodied upper that’s breathable and supportive. It doesn’t smother the foot because it’s slightly pliable and responsive. The overlay system is made from TPU. It’s a durable add-on to the upper, but it doesn’t increase the shoe’s overall weight. It helps the fabric wrap around the foot and make the runner feel snug and secure. The inner sleeve has been treated with the M-Select Fresh anti-microbial coating. It eliminates bacteria that cause bad odors, thus making the interior environment cleaner and healthier for the foot. An EVA insole has been added on top of the mid-sole. It adds a bit more cushioning to the foot. It even features the M-Select Fresh treatment to maintain a bacteria-free platform on which to rest the foot.